There has been and continues to be a need for some new technologies to be validated in space prior to use in a science mission. This is necessary because the space environment imposes stringent conditions on components and systems, some of which cannot be fully tested on the ground or in airborne systems. The In-Space Validation of Earth Science Technologies (InVEST) program element is intended to fill that gap. Validation of Earth science technologies in space will help reduce the risk of new technologies in future Earth science missions. This program seeks to advance the readiness of existing Earth Science related technology and reduce risks to future missions through space flight validation. Recent advancements in small, standardized satellites and increasing, low-cost, access to space are rapidly transforming the way technologies are demonstrated and validated. Meaningful risk reduction for hardware components and information systems can be accomplished quickly for future flight instruments. CubeSats – 10cm cube platforms used as secondary payload to a larger satellite – are leading the way as a standardized platform. They can be inexpensive, as little as $1-2M including launch and basic operations when leveraging prior payload development. They can also built and launched quickly, generally within 18-24 months from concept formulation to deployment. CubeSats can be combined to form 2- or 3-unit configurations for a variety of applications. Although precise numbers are unavailable, there have been approximately 100 CubeSats launched as of 2012. InVEST uses the NASA Research Announcement (NRA) as its primary investment vehicle. angle Spectropolarimetric Imager (MSPI - Instrument Incubator Program, Diner/JPL), a candidate for the ACE mission concept, will produce 95 Megabytes per second per camera and there are nine cameras. There is currently no way to get that amount of raw data from space to the ground. One solution is to move the first stage of ground processing on-board the satellite in a new radiation-hard-by-design FPGA. This would reduce downlink requirements by two orders of magnitude. 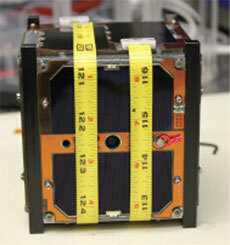 In 2011, the MSPI algorithm and new FPGA were launched on a CubeSat (above), built by the University of Michigan’s Student Space Systems Fabrication Laboratory (S3FL) as an accessory payload to the NASA Suomi NPP mission. Access to space was enabled via NASA CubeSat Launch Initiative.